The massing for this residential development by US architecture firm ISA was driven by its varied types of living units, from apartments and duplexes to three-storey townhouses. Called Folsom Powerhouse, the housing development occupies a full block in Francisville, a gentrifying neighbourhood between Philadelphia’s urban core and outlying areas. Constructed on a gently sloping site, the dense complex offers 31 residential units, ranging from apartments and duplexes to single-family townhouses. The development also contains ground-level retail space on one corner. Ten of the residential units are designated rentals, while the others were offered for sale. The variety is meant to accommodate tenants’ varying needs and budgets. “Powerhouse aims to provide variety and diversity in keeping with the character of the community around it,” said ISA, or Interface Studio Architects, which has offices in Philadelphia and Boston. The complex – which recently received an AIA 2017 Housing Award – consists of rectilinear forms of varying sizes, which are clad in dark brick, corrugated metal and wood. The architects also incorporated three existing buildings into the development, which are situated at different points on the block. 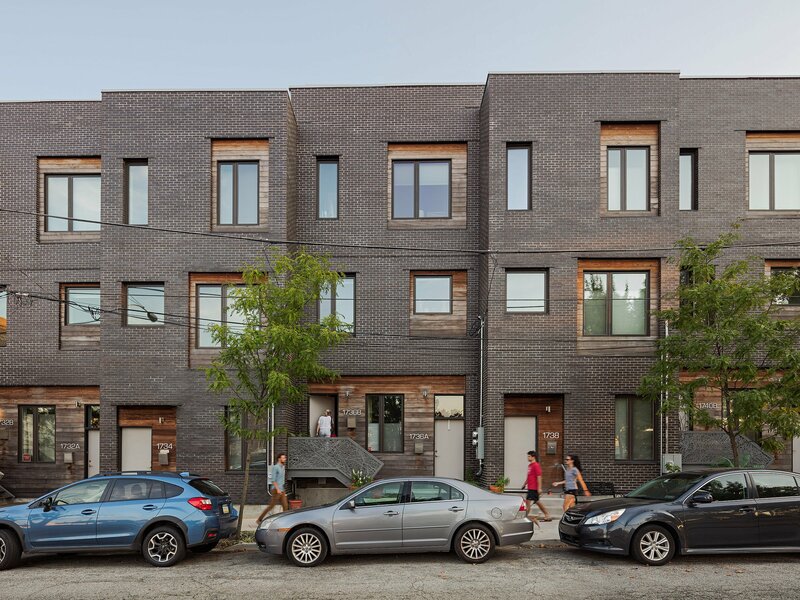 “Three existing rowhouses were integrated into the street wall, inspiring an in-and-out jog along the sidewalk that looks to camouflage the old and new into a single zone,” the firm said. Entryways are fronted by sitting steps and small decks, which are meant to mimic the traditional stoop. Decorative metal handrails were fabricated by local artist Jenny Sabin. A range of floor plans are offered, with many units featuring backyards or terraces. The development has a number of sustainable features, including triple-pane windows and a highly insulated building envelope. Green roofs help manage stormwater, while rain gardens along the curb absorb rainwater on the street surface. “Powerhouse is deeply green as architecture and as an urban block,” the firm said. The project was backed by Equinox MC and Postgreen Homes. Other multi-family housing developments in the US include Blackbirds in Los Angeles by Bestor Architecture, which used a “stealth density” approach to create the urban complex.